With all the time, energy and talk focused on transit issues in this Toronto election campaign it’s easy to forget that most commuters still arrive at work each day by car. In the city 51 per cent do, and in the wider region it’s fully 68 per cent. And while Toronto may not make the top 10 list for the world’s most congested cities, that’s little consolation for commuters (drivers and transit riders alike) stuck in traffic. At 66 minutes on average, they endure the longest round-trip commuting times in any North American city outside of New York. Nor is it any consolation to businesses who are losing time and money because of gridlock. Indeed, a 2009 Metrolinx study found that road congestion costs the region $6 billion a year in lost productivity. And a 2013 report from the C.D. Howe Institute found that could be as high as $11 billion when “opportunity costs” to businesses — when people choose to stay at home, rather than battle congestion to travel or engage in other activities — are factored in. Further, road congestion, like that along the Toronto-Waterloo corridor, can affect whether key companies, such as Amazon, choose to locate in the region. 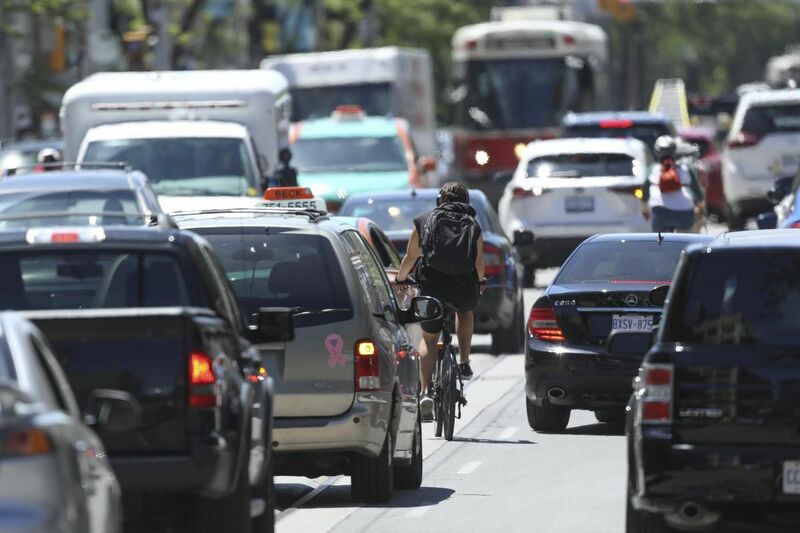 If congestion isn’t alleviated, “our economy — like our goods and people — will remain stuck in traffic,” warns Jan De Silva, CEO of the Toronto Region Board of Trade. So where are the election promises on reducing congestion? Unfortunately they aren’t getting the air time they deserve, though both the leading mayoralty candidates, John Tory and Jennifer Keesmaat, have strong ideas on this issue. Here’s what the public needs to hear more on before voting day on Oct. 22. First, reducing congestion isn’t necessarily about widening and building more roads and highways. In fact, that can be counterproductive. Widening roads in the city kills off the ambiance that attracts people and businesses to the city in the first place. And building more highways is often an exercise in futility. In fact, studies show for every 1-per-cent increase in highway capacity, traffic increases by 1.1 per cent within five years. In other words, drivers are worse off. That doesn’t mean commuters don’t need highways to get to the city and broad avenues to traverse it. But it means politicians should also be looking at simpler solutions to reducing congestion. The first, as the Star argued last week, is to invest wisely in transit. Overcrowded and delayed buses, subways and streetcars are driving riders away from the system and back into their cars. It also bears repeating that fares should not be hiked, something Keesmaat has committed to. Even a 10-cent increase could result in the loss of three million riders a year. The second way to reduce congestion is to put tolls on the Gardiner and Don Valley Parkway. Tolls reduce congestion in two ways: they discourage people from driving and raise money for transit projects that attract riders. In fact, a plan to impose $2 tolls, pushed through city council by Tory in 2016 and supported by Keesmaat, would have raised at least $200 million a year for transit projects. The Wynne government, however, killed the plan by refusing to allow the city to charge tolls — reportedly in response to pressure from Liberal MPPs from 905 ridings who thought it would be an election issue with suburban voters, though urban drivers would also pay tolls. While it is unlikely to find favour at a Queen’s Park run by Premier Doug Ford — he’s opposed to tolls (as are the New Democrats) — it’s still a good idea. Smaller measures, too, can have a big impact on road congestion. And on that front, Tory has to take some action. Working with council, he extended work hours on road maintenance and construction projects, so closed lanes could be opened more rapidly, and imposed tighter restrictions and higher costs to deter developers from closing off lanes around construction projects. He also promoted a traffic warden program to prevent blockage at major city intersections, “quick clear squads” to reduce the time that lanes on the Gardiner Expressway and DVP are blocked after accidents, and a high-profile program to ticket drivers who block lanes in rush hour. Further, he pushed at council to put more money into red-light cameras to curb people from blocking intersections, “smart” traffic signals that use sensors and cameras to adjust to traffic needs, and invested in the re-timing of traffic signals. All these small steps add up to a big reduction in congestion. A Canadian Automobile Association report, for example, found that for every dollar spent on traffic light re-timing, alone, the public saved $64 in time, fuel and air pollution benefits. The association also endorsed more segregated bike lanes (championed by both Tory and Keesmaat), which encourage drivers to abandon their cars by making cycling to work safer, and car sharing programs, such as Communauto and Car2Go. In fact, as Keesmaat points out, the solution to congestion isn’t targeting car usage, but increasing choice, whether it’s improving transit to attract riders, building more safe bike lanes, or integrating housing and transportation planning so that people can walk to work. The studies are in. Candidates know how to reduce congestion. Now they need to explain how they will address it.